You should have completed step 1, and surfed 50 pages. If so, your account is now active. What that means is that your site(s) are rotating in our system. Most traffic exchanges have a surf ratio but here at ListSurfing, it doesn’t exist. As long as you remain active there is no limit to the number of views you may receive. Additionally, you don’t have to worry about assigning credits to your website – it doesn’t exist at ListSurfing (you get views for FREE), you will use those credits to send email ads which I’ll explain below. You can point your mouse over the 4 buttons to the right (under the action column) to see what each do, but you want to make sure your site has a green check mark, like in the above example. If this icon is showing, that means your site is rotating and will be seen by other members. Depending on your membership level, you can have 1, 3, or 5 website rotating at once, but you can have up to 15 added to your account so you can quickly switch between websites rotating. Your sites will continue to receive traffic non-stop as long as your account is in active status. In order to get views to your website in the surfing area your account must be “active” Basically, this means that you’ve met the requirement of surfing 50 pages in the past 30 days (you do not have to do this all in one day). If nothing else, set a reminder for yourself to surf 50 pages at least every 30 days. If you are not active, you will see a notice at the top of your member area within a blue box, stating how many pages are required to be viewed before you are active again. As you surf you are earning mailing credits. You will earn more mailing credits if you are upgraded, but even as a free member it is extremely generous. This means for surfing you get exposure to your websites to surfers and also through email ads. I bet this is way more valuable than any other advertising system you’ve used before! Once you’ve accumulated some credits you should always send out an email ad. 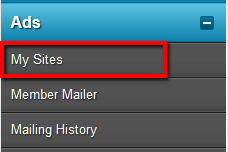 To do this go to Ads > Send Email Ad from the members area menu. You will be asked to fill in a subject line, email body (plain text), and the URL of the website you are advertising. Adult content is not allowed, but other than that you can pretty much advertise anything you like in your email ads. These email ads will go out to your fellow List Surfing members. For every credit you spend your email ad will go to one active member. The credits to use field will be pre-filled with the max amount of credits you can use based on how many you have or how many members there are to mail, so I recommend to leave it at the pre-filled amount. To add an image in the custom box, you need to use code such as the following. You would put the web address of the image in place of the address below. You can customize the size, if you need to shrink the image, with the sizes like this example. I am new to this site & hope to meet a lot of great people, make money & have fun. New here and I need to change my Pass word?? equally interesting to me ! After all these years I am still using ListSurfing and getting results. So far so GREAT…and I just got started. Nice site. Are people really bookmarking sites? New and not sure where to begin?